Adria Airways is likely to lease Bombardier aircraft for the 2020 summer season after its plans to acquire fifteen Sukhoi Superjet 100 jets fell through. Adria's CEO, Holger Kowarcsh, said, "Adria will most probably lease Canadian Bombardier planes. The 2020 summer season is now being planned so we will see what sort of fleet is required". The airline currently has twelve Bombardier jets in its fleet, although half of them are being wet-leased through ACMI contracts to other airlines over the summer. Adria itself does not own any aircraft. Its two CRJ700s are being leased until December 2019, a further four CRJ900s are under contract until 2022, another two until 2026 and 2027, while one of the jets is being leased through a pay-by-the-hour agreement, where Adria pays its dues to the lessor based on aircraft utilisation. The remaining two are under long-term leases. Last June, Adria signed a contract to acquire an additional three Bombardier CRJ900 aircraft from lessor Regional One, which were to be delivered in 2019. Commenting on the status of the deal late last year, Adria noted, "The order for the CRJ900 is still an option for us". At the time, the carrier said it would also consider adding more of the seventy-seat CRJ700 aircraft to its fleet in 2019. 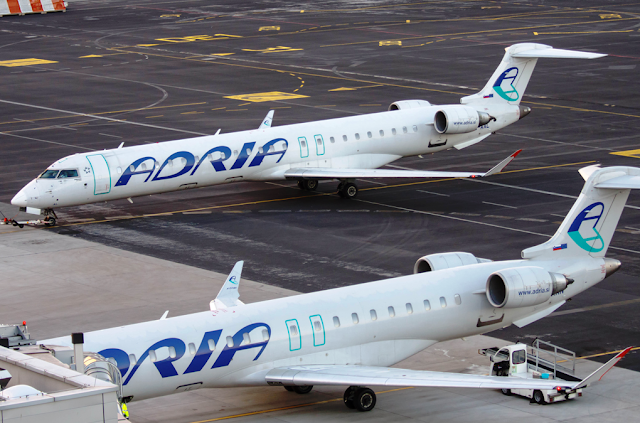 Adria added two CRJ900s last year. The Ljubljana-based maintenance company Adria Tehnika is a Bombardier Authorised Service Facility. Its agreement with the Canadian plane manufacturer is set to last until 2021. Mr Kowarcsh previously noted that the Slovenian carrier's fleet is too small and needs to grow in order to support its route network. "I think critical mass for us would be in the range of 25 to thirty aircraft in the future. We're a small carrier, we have to grow, strengthen our operations and improve our connectivity", Mr Kowarsch said. In addition to Bombardiers, Adria also boasts three Airbus A319 and six Saab 2000 aircraft in its fleet, although two of the turboprops are wet-leased to Swiss International Air Lines, while another two are stored. The airline's average fleet age stands at fifteen years. Hopefully we see some new routes in summer 2020. Is there a chance for any of the routes launched last year to be resumed? I would work hard on resuming Moscow. Too late for Moscow. Route already taken over successfully by Aeroflot. I still think Spain would be a good choice for them in the future. Not only Spain, Rome too. Ryan cancelled Trieste Rome flights, so there is only Alitalia now. Interestingly they wanted to start flights to Belgrade and even inquired relevant regulators about it late last year. Will they try to blackmail Bombardier like they tried to do with Sukhoi? On a more serious note, kudos to them for planning for 2020. Bombardier isn't desperate as Sukhoi to sell aircraft. And if you can't make a deal with Sukhoi, which would probably do almost everything to have a Star Alliance airline in Europe flying their aircraft, then I think that says enough. Would be nice if they eventually replaced the CRJs with a mix of A220s. Way too expensive for JP. Too expensive, I doubt their business model now supports anything else then leasing older aircraft. Airlines with much solid balance sheets are tough to manage A220. E2 would be good feet of them or the best, keep calm and fly CRJ. Adria used to have the youngest fleet in ex-Yu by average age but it has been dragged down by the ancient Saabs. True. Even the CRJs they leased last year are very young. Well they don't take good care of their planes at all. Look at the photos in this review from yesterday. Carpets completely ripped on this CRJ. The saabs are the dinosaurs in the family. Without them Adria would still have the youngest fleet in ex-Yu. Clearly no money to fix even the carpets in the cabin. I wonder what else are they saving money on. The real question is how many of these planes will actually be operated by Adria for Adria and how many will be wet leased. I assume they need just 15 planes max for LJU/PRN ops. The rest will be leased out. 15 planes? For how many legs? 80-100 daily? Finally some good news for Adria. Well it's good they are thinking Bombardier and that they are already planning for 2020 summer. With what money will they lease CRJs? Well it's a much better choice than the Sukhois to be honest. They already have the most CRJs in the fleet in this region I think so it makes sense. Except for OU I don't think any other airline in the region has CRJs. OU does not have CRJ s. They lease them from Spain for 4 or 5 summer months. OU has only Q400 and A319/320 in its fleet. Yes but I meant they are operated in their fleet during summer and probably next winter too. Odd they don't go for the CRJ1000. It's a very good aircraft and could lead to the retirement of the A319s. CRJ1000 has about 40 seats less than the A319 and the leases for 2 A319s are appareantly very costly to withdraw from. Ha in 2007 Adria placed order for CRJ1000 and was supposed to be the launch customer. Never materialised sadly. Wow really? Didn't know that. What happened? Why wasn't it delivered? Order was converted to CRJ900. Oh I see. Thanks for the info. Interesting stuff. Cause Adria started making loads of $ and LJU became a major transfer airport that destroyed the competition in the neighbourhood..what do you think happened? Leasing some CRJ1000 could make sense. It has better CASM than the good CASM CRJ900 (and obviously similar crew training than the CRJ900). However, take off / rate of climb performance are weaker than the CRJ900. Is rate of climb an issue at LJU? Why are some of the Saabs still inactive? They should try to get those up in the air first. They fought hard to get them in the first place. They need to to do something about the lack of pilots. Plenty Saab pilots from now bancrupted/merged airlines in Scandinavia etc. are available, but Adria won't pay what it requires. And if they settle with moving to Nordica etc., with pretty bad salaries, then you know how bad it stands at Adria. Which routes from Ljubljana are the Saabs being used on? Given that most of the 50 million euros of debt they have amassed is owed to the CRJ leasing companies, I call BS. Interesting. Hope none of the planes gets repossessed. They need some larger capacity and longer range planes. Couple of months ago they were flying a charter from ljubljana to Hurghada and it had to land in Cyprus because head winds were strong and they wouldn't have had enough fuel to make it all the way. CR9 of course. During winter they wet leased all Airbuses to Lufthansa. This airline cops too much crap from people. I'm glad they are looking towards the future. This announcement is merely a spin to reassure that the company will still be around in 2020. Which it most likely won't be. That's it. The rest they can lease out. OK, I will try to explain it for everyone here, as I see people in the comments still don't get it. JP currently owes 50 million euros (or more) to its contractors, most of this money is owed to the owners of CRJ's (ie the leasing companies). The reason the leasing companies are not grounding JP is simply the fact that no one wants to lease old CRJ's - so it's commercially better for Adria to have them, even if they are not paying for it regulary. They cannot buy new or used airplanes - it is simply not possible in this universe. JP cannot get a bank loan with the current state of finances. They also cannot lease any 'good' airplanes, because the leasing companies know they cannot afford it. They can only lease old CRJ's and SAAB's. The thing that's going in 4K's favour is that they are paying salaries on time. Once that stops, the first card in the pyramid will fall. Petrol and Fraport will not pull the plug on Adria, as they also lose more than gain. Airport fees in other conutries - that's another story. They have pay those on time, otherwise they will ground their planes (which almost happened a couple of months ago). So this is a huge pile of debt, and the only reason it's still standing is the fact, that it's more profitable for the creditors to recieve payment every X month, than to close it down. But sooner or later every Ponzi scheme collapses, there simply won't be enough money to finance everything. So the question is what happens to LJU if Adria goes bust. You are right. The good thing is Slovenia is in the EU so any EU airline can take over whichever route they wish. They had a bunch of really bad PR regarding SSJ100, at the end it was complete disaster, everything canceled, they were attacked by Russians, everybody started talking about their bad finance situation. Now they need something to spin story around, so they started this story about next summer. OP. Who are you working for? I know the company is having some troubles but there is one good thing they fixed and that is that there are almost no cancellations anymore. Last year was a nightmare but this year things are going smoothly. Well they are operating significantly fewer flights. Perhaps they learned a valuable lesson. They are still paying out compensation to passengers for all the delays and cancellation from last year. Adria can not delete Twitter posts. Is there a chance for someone to buy Adria and resolve their debt and fleet issues? 4K did just that couple of years ago. They are doing a fantastic job I must say. I'm just waiting to see what 4Ks end game is here. I don't get their strategy... if they have one. I wouldn't say they have one. Adria needs a plane between the Bombardier and Airbus. The Airbus is too large for pretty much anything other than charters. As someone said the CRJ1000 would make most sense. The smaller and older the plane is, the more weaker you are in the jungle. Europe today is a true battlefield and the hungry big sharks are waiting for the next prey to fall. Around 10 companies went bust. The old boys from AF, BA, KL, LH, etc know exactly how to tackle difficult situations. JP must initially get 2 bigger leased planes and increase capacity to be more competitive, to focus on important destinations and mostly charter summer and winter destinations. The other possibility is to simply merge with another bigger airline and act like a feeder. This can be SQ, JAL, QF and so on. Or they can deploy the A319 to DXB and collaborate with EK. Today, the S2000 has no place in Europe where almost every aircraft is now either an A320 or a B738. (short-medium range). Those companies you mentioned are so massive that the little feed they would get from Adria is really unimportant for them. Interesting times ahead that's for sure. Fleet expansion? Why do they need one? Hopefully to grow their network. How about having a cabin refurbishment program? The CRJ900 has the best CASM on the regional jet market, and currently fit perfectly with Adria's network. CRJ1000s (used) could later complement the fleet with little introduction costs. 1. They don't own any aircraft. Everything is leased. 2. With what money would they pay cabin refurbishment, if they can't even fix one carpet? Couldn't the lessor / owner pay the refurb upfront and pass on the costs via higher monthly payments? Adria already owes money to the lessors. Why would they contribute to that debt? Wow, I'm now realizing Adria’s scary state. Despite "apparent" low unit costs, Adria still can't fetch enough "net' revenues to stay on top of their leasing payments. I just hope they get better - before some other LCCs steals / eats their lunch with better maintained planes. Could expanding AirBaltic be a possible competitor, with their new CS300s and not so new Q400s? SSJ100 perhaps was not ideal option, but it was only option. And they was planned for this season.